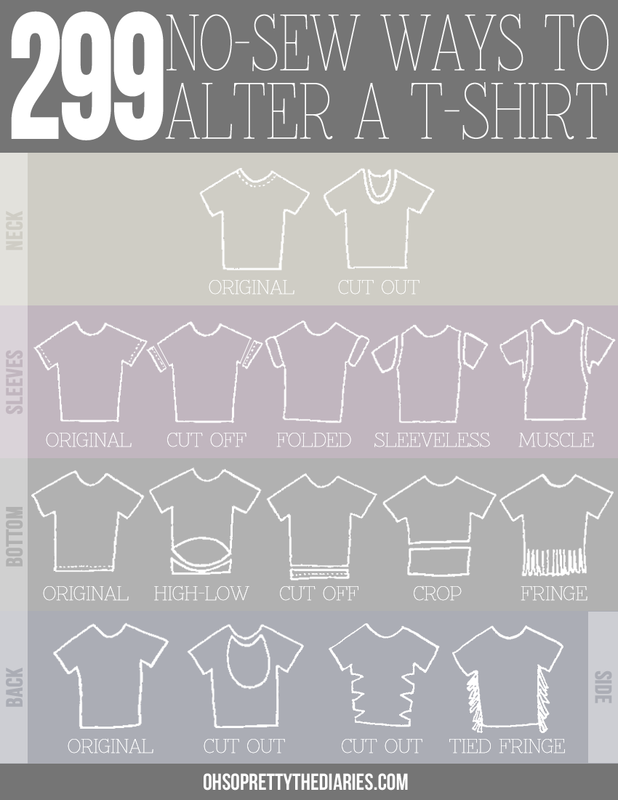 I know, this may seem a little crazy... Who would sit around and think of 299 ways to alter a t-shirt? It actually wasn't like that. It was more like, I want to do a post about all the ways you can alter a t-shirt and then I got overwhelmed because I kept thinking of so many different things you can do. So I decided to make a little graphic showing all the ways I though of. I'm sure I've forgotten something but this is specifically about not having to sew. All you have to do is cut and in some cases, tie. If you add sewing in, that is a whole new ball game and that's just too much for one post. There are 5 categories: neck, sleeves, bottom, back and side. Just pick one way in each category and get to cutting! I must also note that in the category of "side" there is also an option to do nothing, making it 3 choices instead of the 2 in the picture. You can also play around with using baggy shirts or fitted shirts. Oh, and if you are wondering "Why 299 and not 300?" The last one would be choosing "original" in each category and you'd end up with the exact shirt you started with... un-altered. So, there's that. Now, I'm going to show you two ways I've recently altered a shirt. 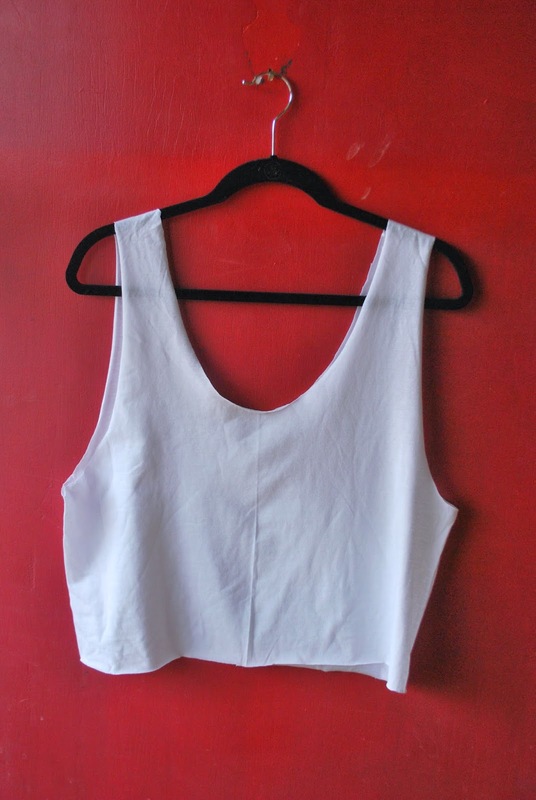 To make a crop tank, make these cuts. Cut the sleeves off right next to seam. Start cutting the neck by the seam and then go into a more deep scoop-like shape. Stretch out the edges where you just cut by grabbing either side and pulling. This makes the edges look less choppy! And then you have a nice little crop tank! This shirt is a bigger shirt so I'm doing muscle sleeves and a fringe bottom. The bottom of the sleeve is low enough so I started cutting there and then cut diagonally to where my shoulder would be. I also cut off the trim at the bottom so there wouldn't be any weird edges on my fringe. Start cutting fringe. I wanted smaller fringe, which takes FOREVER. After you've cut your fringe, pull each piece to stretch it out and make it look less like you just cut it. I LOVE this design. Got this guy at Goodwill, it was brand new AAAANNNDDD it's glow in the dark.....what?!? That could be weird or awesome, we will see! 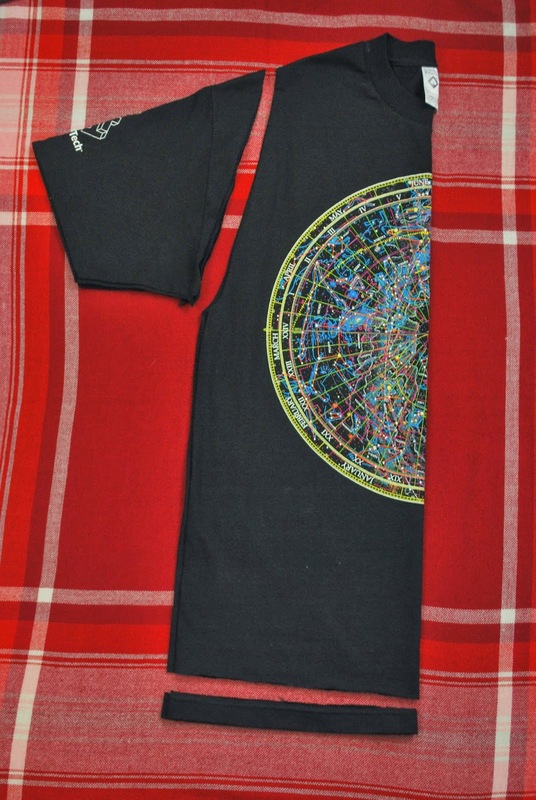 If you don't have any old t-shirts, just buy some and you can put your own designs on it. Anyway... hope this is helpful! And may you never have a plain boring t-shirt again! I should do this to a bunch of my older shirts! brand new and glows in the dark...jackpot! Definitely going to have to do this with some old shirts! Why can't we see the entire graphic with ALL the ways? The to graphic DOES have ALL the ways. You pick one from each group (each includes doing nothing to that part). There are 2 neck options, 5 sleeve, 5bottom, 2 back, and 3 side. 2x5x5x2x3 = 300 -all oroginal. The grapgic would be messy and more complicated with each shirt option complete. Cut out neck, cut off sleeve, crop, cut out back, cut side. Ok. That is just three and only one option changed on each. 299 would be a LOT to draw out for little gain. It would be difficult to see them all as small as they would be to fit a chart.